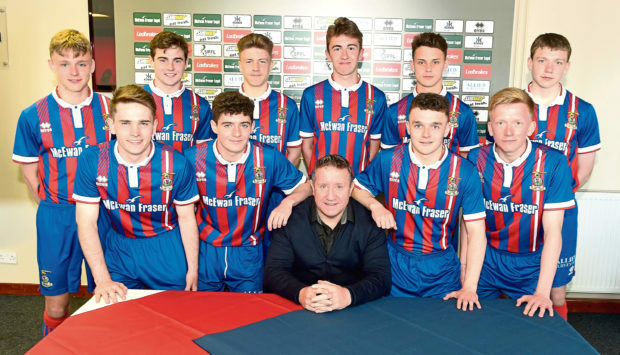 John Robertson with the 10 youngsters that signed their first professional deals with Caley Thistle. John Robertson is reluctant to add further to his Caley Thistle squad if it blocks the paths of the club’s promising youngsters. A batch of 10 under-17s signed their first professional contracts with the club over the summer and Robertson has high hopes for them to push into the first-team this season. Such an opportunity was grasped by Daniel Mackay in the last campaign, emerging from obscurity to become the club’s youngest goalscorer and set up the winning goal in the IRN-BRU Cup final. Five players – Angus Beith, Tom Walsh, Shaun Rooney, Jordan White and Jamie McCart – have already been added this summer but the Caley Jags boss is keen to leave room for the teenagers to flourish. Robertson said: “We’re not far away now. People are still saying we could do with another central midfield player but that’s dictated by budget. We’ve got good options in the attacking and defensive areas and in the centre, we’ve effectively got two positions that Liam Polworth, Angus Beith, Charlie Trafford and Joe Chalmers can fill. “We’ve got a trialist in too but we have to be careful we don’t block the route of the young lads. They need a pathway as Daniel MacKay had last year. If we start with this size of squad now then I will be happy. “We have got to look at the fact other teams may come look at our players, which may change the dynamic. We looked at the areas we wanted to strengthen and got most of our options in. Some were keen to come but we couldn’t match their wage demands. We had to bypass them and go for the next one. The players were back for pre-season training yesterday and their first friendly is a double-header on the same day. Strathspey Thistle and Keith will be played on June 30 by two senior squads split between the two venues, with the same happening on July 3 with Rothes and Forres and July 10 at Brora and Buckie. Robertson added: “We spoke to the medical staff to see how we could get round having the squad training and recovering on different days, if we split the squads up. Both would be off the following day and then in for a day of recovery. It’s just to keep the fitness levels the same as everyone else.